It is truly a great loss that Ms. Haiyan Qian passed away. I have only now learned about this sad news in grief and shock. Haiyan has not only been an insightful and knwledgeable professional, but also a charismatic yet considerate leader who appreciated the efforts and commitment of her staff and colleagues. Although I did not get to meet her in person, it was an honor to have worked with her and to get her words of encouragement and appreciation despite working with her remotely in Seoul. Although the time has passed, I would like to express my deepest condolences to her family. Thank you Haiyan for your dedicated work and a great leadership. When I first heard of her news through a mailing list last month, I was really shocked. Could not respond to this with words….. Now I visit to find her remains in this site and glad I found this dedicated section for her. We know each other since 2007 Rio UN IGF meeting… When I first heard she was on medical leave in 2011, I did not know she was fighting cancer. Recently, we met again at Baku IGF meeting last year. If I knew it was my last chance to see her, I should have hugged her instead of exchanging our warmy-eye-and-smile-hellos to each other. As many people said here, she is a great person, very humble, devoted person for her work and family. We all appreciate her contribution and work at IG space. I feel so sorry and sad that Ms. Haiyan Qian passed away. I remember her as always optimistic and smiling woman. I remember her leading a meeting of DPADM, it was so positive and amusing… I cannot understand that she was so seriously sick, and even already at the time when we have been at the UN as interns in summer 2012..
My sincere condolence to all her family. I have just read with shock the passing of Director Haiyan Qian, when I visited the UNPAN website this morning. Even more shocking was that she died of cancer about a month ago, something I am learning for the first time. Haiyan employed me to the DPADM/UNDESA in February 09. As I’m now learning she also became Director that same month I was employed. During the brief period I interacted with her; first in her office and when she visited our office in Seoul; she came across as unassuming leader with a friendly disposition, well composed, articulate and in control of her brief in discussions with her. I communicated with her directly through emails during the brief period I was in charge of the Seoul office and got a good sense of her dedication and professionalism. I would like to take this opportunity to offer my heartfelt condolences first, to the husband, daughter and family, and secondly, to all her close colleagues and staff of the DPADM and all her colleagues and friends in the Secretariat. She was a huge loss. ICAP’s family feels very sad about the departure of Ms. Haiyan Qian, a great person, professional and friendly. Our deepest condolences to his family, colleagues and friends for irremediable loss. I just came across this sad news. I am shocked to know that i couldn’t meet you personally as i desired for my research in Africa. I travelled to New York in February and requested an appointment , unfortunately i was informed you were absent . I am deeply saddened to know i will never have any meeting with you again. I believe we can continue in the pattern you started so passionately in the field of public administration. I was a big admirer of Ms. Haiyan Qian. She was a very humble, committed public servant I have had a rare opportunity to associate with. She would even reply official Emails at the weekend. This is the extent to which she was committed to serving humanity. Good people go so quickly! I was deeply saddened to learn the news about the Hayian Qian death. I knew Hayian since 2002, when NISPAcee became a member of UNPAN. It was always pleasure to work with her and I amired her commitment and highly professional work for the UNPAN project as well as UNDESA, and her dedication to all aspects of the UN mission. She was an outstanding personality not only professionally but also personally. She played a great role in breaking boundaries between nations and expanding international cooperation. We mourn the loss of a helpful and reliable partner. Please allow me on the behalf of NISPAcee to express our sincerest condolence to her family, close friends and colleagues. My dearest Haiyan I miss you a lot.. Since I left UN in 2008, I never forgot my wonderful, charming, nice, kind, human… friend Haiyan… Always I was planning to come back to New York and see you… Unfortunattaly, you left so quickly… without any notice… and I am so sad I did’nt see you!!! The Heaven is for you and hopefully we will join you!! 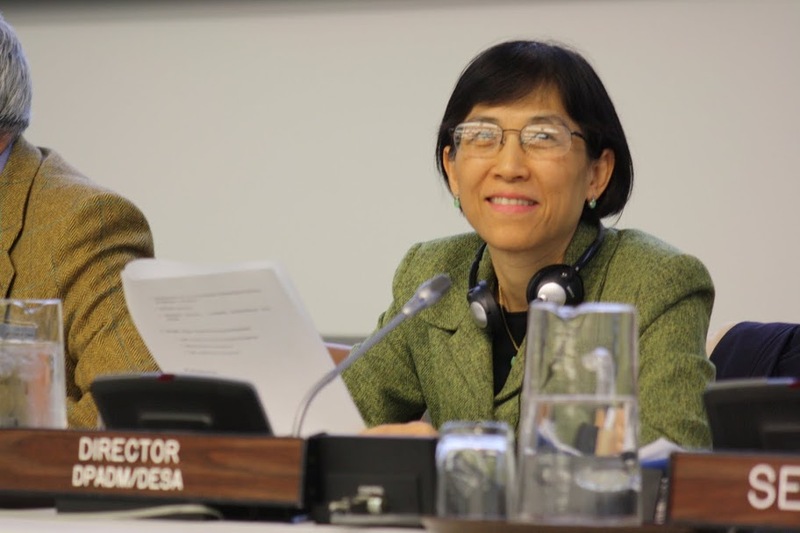 ECLAC is very sad because of the death of our colleague Ms. Haiyan Qian. She was always a great person and great professional. We send to all the colleagues, family and friends our condolences and support during this difficult time. I just heard about this sad news. I am a former intern at the DPADM and had the pleassure to meet Ms. Qian. My sincere condolences to her family and to DPADM familiy. Qian Xiaoping (Haiyan’s former name) is my sister’s pal and they were very close since primary school days and remained so until we lost her. All her childhood pals are very sad after learning that she left us. In memory of her and to express our condolence, we have make accessible our Reunion Page to all who share our feeling. I have left a message on the Chinese board and want to leave another message here. Saijin’s family used to be very special for us. His sister was my classmate at the college, and his brother was my sister’s classmate. We visited their home almost everyday and spent every Chinese New Year Eve with this family when our parents were not in Beijing and their mother was alive. Then Haiyan came to join us. She was a nice girl with excellent talent and intelligence . We all loved her very much. Haiyan will live in our harts forever. News of Haiyan’s death came as a personal shock to me. As a former colleague I have seen and known Haiyan very closely – a very dedicated professional Haiyan was also known for her kind and compassionate demeanor. There is no doubt that she will be dearly missed by her colleagues and with her untimely death the UN had lost one of its most committed professionals. May God bestow upon Haiyan the peace and happiness of the heaven. I am truly saddened by Ms. Haiyan Qian’s death. She was an amazing individual who dedicated her career to global public policy, governance, public administration and development.I am confident that her legacy will continue. I first met Haiyan in Seoul in 2007 for an UNPAN training and the Korea E-government workshop. It was my first travel abroad, but people like Haiyan Qian made me feel easy as I felt very much welcome and did not experience any sense of alienation. It was heartbreaking to learn that we lost such a great person, leader, and colleague as Haiyan Qian. My deepest condolences to the DPADM and Haiyan’s family. Although she now rests in peace, I am sure that her legacy will live on—a legacy for better governments around the globe. I was shocked to hear the news about the passing of Ms. Haiyan Qian. It is a great loss of us. We all know about her contributions on global public policy, governance and public administration. She has been an inspiration to us all. May her soul rest in peace. I just came to know of this news. Having interacted with her over the past 3 -4 years, she always came out as a helpful, sincere and dedicated professional. My deepest sympathies and condolences to her family.